Micromax Canvas Turbo (Quick Review) launched yesterday lies in the same price range as Micromax Canvas Doodle 2 A240 (Full Review). Both of these devices come with non expandable storage and Micromax Software tweaks. Let’s put them head to head to understand which one will be a better choice for you. Micromax Canvas Doodle 2 comes with a large size display of 5.7 Inch diagonal length. The display is significantly larger than 5 inch Micromax Canvas Turbo and will offer you 1280 x 720 pixels resolution which leads to pixel density of 258 ppi which is enough to avoid pixilation but won’t give you crisp and sharp display on the large size screen. The Micromax Canvas Turbo offers more pixels on a smaller 5 inch display. The full HD 1080P resolution shoots up pixel density to 441 ppi which lies around the top of the ppi number game. This display also supports 16.7 M colors (true color) instead of 16 M colors in Micromax Canvas Doodle 2. Thus Micromax Canvas turbo is better in the display department. If you like extra large displays and like to read e-books on your smartphone, then perhaps Doodle 2 will suit you better. Both of these phones come with Mediatek MT6589 series system on chips. The doodle two is powered by 1.2 GHz Quad core MT6589 chipset with PowerVR SGX 544 MP GPU clocked at 286 MHz and 1 GB RAM. Whereas the MT6589T chipset in Canvas Turbo, ticks at 1.5 GHz and comes with the same GPU clocked at higher frequency of 357 MHz. Yes this processor backed by 2 GB of RAM is expected to be more efficient than doodle 2’s chipset with respect to UI transitions and Multitasking. The camera unit in both of these smartphones is same and is also similar to other phones in canvas series. These smartphones sport a 12 MP/ 13 MP Auto focus camera at the back and a 5 MP fixed focus camera at the front for video calling and this is the maximum what MT6589 series can support. Micromax has provided added features in Canvas Turbo’s software and has added 360 degree panorama mode and HTC Zoe like Object eraser tool, which lets you remove object from the back ground. It also comes with a cinemagraph feature which lets you create a .gif file and animate still objects. 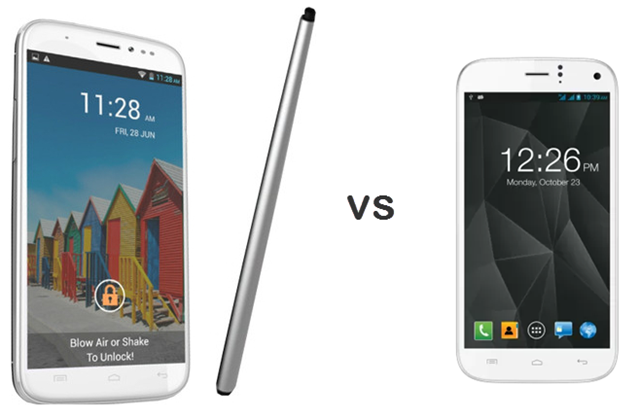 The memory features of both of these phones are similar. Both of these smartphone come with non extendable 16 GB On board storage out of which 13 GB will be available to the users. For most general purpose users the storage will be sufficient. Micromax Canvas Doodle comes with a 2600 mAh battery which is highest in an exception to 2000 mAh battery we have seen in all other canvas series devices above 10,000 INR including Canvas Turbo. This battery however has to power the extra large 5.7 inch LCD display and power up the corresponding display backlight. The battery in Doodle 2 will give you 8 hours of talk time and 220 hours of standby time which is more than what Micromax Claims Canvas Turbo will offer. Micromax Canvas Turbo’s 2000 mAh battery will provide you with 7 hours of talk time and 105 hours of standby time which will restrict you from enjoying the Full HD display to its best. Both of these phones come with various gesture features like Blow air to unlock, video pinning, easy answer, etc and Micromax Canvas Turbo add a few other to the list like Multi Video View and iFloat which will help you with easy navigation and multitasking. Micromax Canvas turbo comes preinstalled with Apps like BBM and Hike messenger. Micromax Doodle 2 comes with a Stylus which lets you doodle on the large screen real estate, but the stylus does not fit into the body casing. RAM, ROM 2 GB RAM, 16GB ROM 1GB RAM, 16GB ROM but No MicroSD Card slot. Micromax Canvas Turbo has faster processor and sharper display. You will have to run it on low brightness to make it last a day. Micromax Canvas Turbo offers admirable hardware specs for a competitive price of less than 20,000 INR. It also comes with attractive full Aluminium body whereas doodle 2 is quite heavy. Only reason to choose doodle 2 over Canvas Turbo is if a bigger Phablet display and Stylus are on the top of your list.